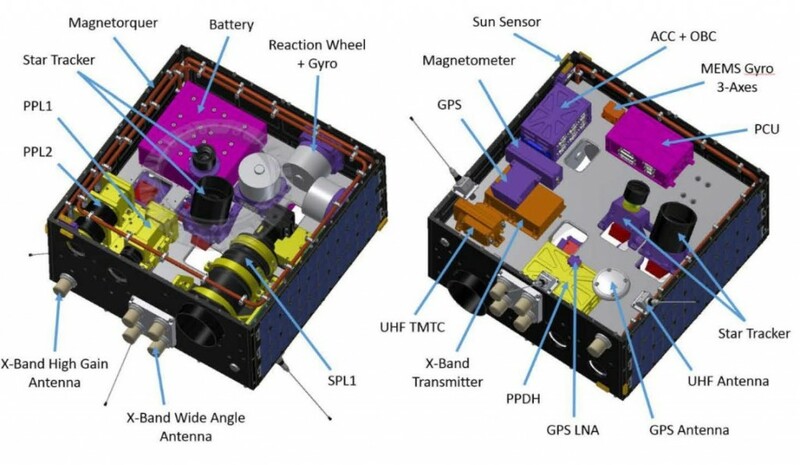 Kent Ridge 1 is a microsatellite mission developed and operated by the National University of Singapore, carrying a hyperspectral imaging payload for remote sensing. 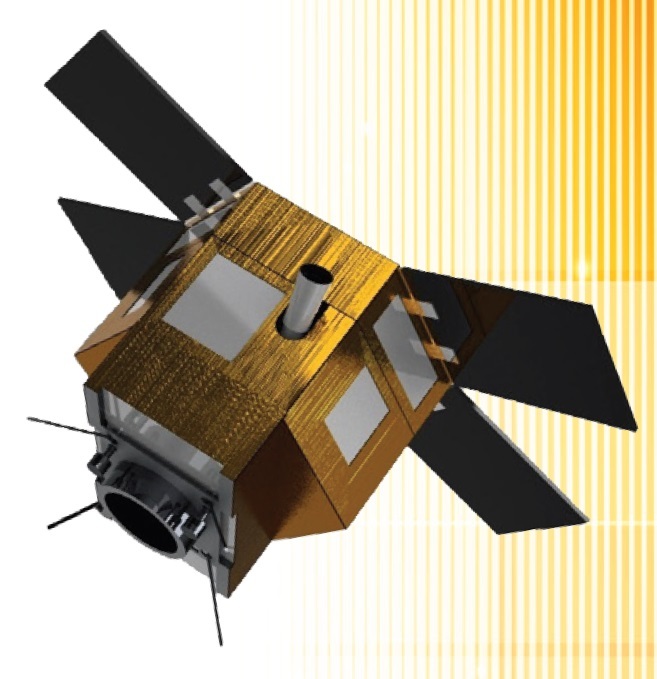 The primary objective of the mission is the demonstration of a Visible, Near-Infrared, Short-Wave Infrared Fourier Transform Recovery Instrument integrated into a microsatellite bus for a number of applications focused on the monitoring of land, water and vegetation as well as disaster monitoring and management. The project is a collaboration between NUS and Berlin Space Technology with its educational partner, the Technical University of Berlin. The KR1 satellite is based on the LEOS-50 satellite platform of Berlin Space Technology and has a mass of around 80 Kilograms, measuring 57.5 by 57.2 by 38.4 centimeters in size. Structurally, the box-shaped satellite is comprised of a solid aluminum structure. It uses passive thermal control. Power is provided by Gallium-Arsenide solar cells installed on four of the satellite side panels feeding power to Lithium Iron Phosphate batteries. 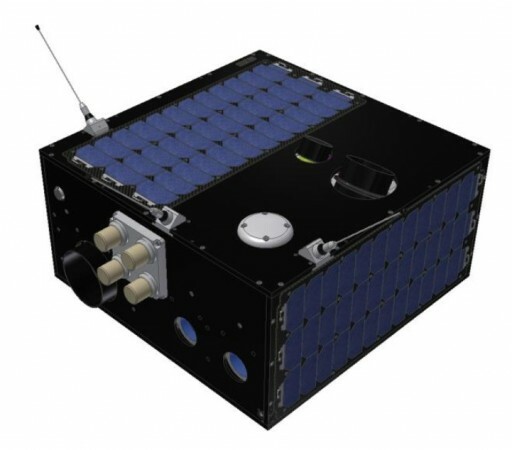 The satellite delivers a peak power of 120 Watts and the in-orbit average is around 20W. A power conditioning unit delivers a 15V unregulated bus and voltages of 3.3, 5, 12 and 24 V to the various satellite subsystems. 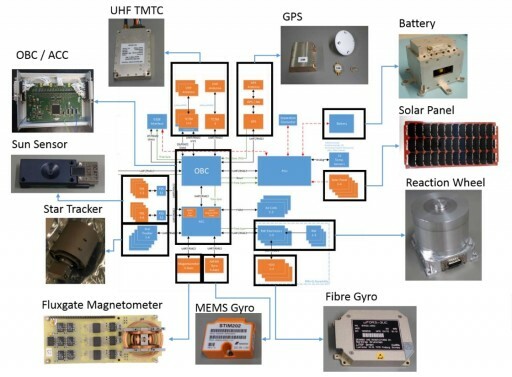 The satellite’s attitude determination system is comprised of a pair of sun sensors, two star trackers and three-axis gyros while attitude actuation is provided by three reaction wheels and three magnetic torquers that are in use during spacecraft safe mode and for reaction wheel unloading. The attitude control system delivers a pointing accuracy of one arcmin and ensures a low-jitter environment for imaging operations. All attitude determination functions and commanding of the actuators are centralized within an Attitude Control Computer that interfaces directly with the Onboard Computer of the satellite. The KR1 satellite uses GPS for orbit determination and timing synchronization and communications are handled by a UHF/X-Band system. UHF is used for low-rate telemetry data downlink and command uplink while the X-Band terminal downlinks the payload data at a rate of 100 Mbit/s. Internally, the satellite supports raw data rates of 2.2 Gbit/s for onboard processing and storage. 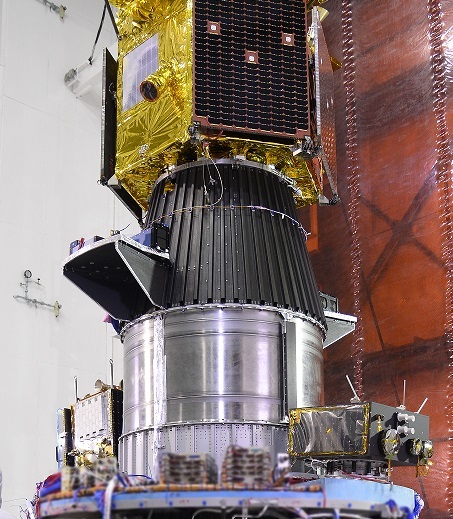 The Kent Ridge 1 satellite hosts three payloads, two medium resolution hyperspectral Fourier Transform Recovery instruments collectively known as the Primary Payloads and a high resolution video camera referred to as Secondary Payload. 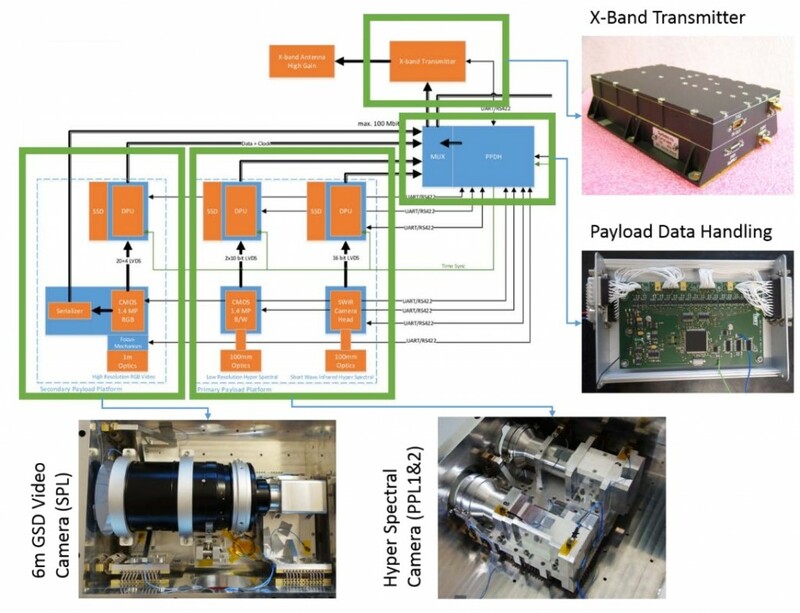 The Four Transform Recovery spectrometry method builds the basis of the primary payloads of the KR1 satellite. Conventional spectrometers or the Michelsen Interferometer rely on diffractive elements (gratings or prisms) to disperse the light so that different wavelengths fall on different areas on the detector array, enabling a measurement of the intensity as a function of wavelength, creating the spectrum. In the Fourier Transform Spectroscopy, the incoming light beam is split in two beams that are then routed through different, but precisely known optical path lengths, creating an interference between the two beams which can be detected. FTR, Fourier Transform Recovery, employs a cascade of of specially oriented birefringent crystals (double refractive and beam splitting elements) that deliver an ordinary and extraordinary ray with orthogonal polarization. The two rays experience different refractive indices when passing through the medium so that fringes can be created in optical images from which post processing can yield the desired spectral data. The big advantage of this type of system is its robustness and stability as well as its versatility over a broad wavelength range. 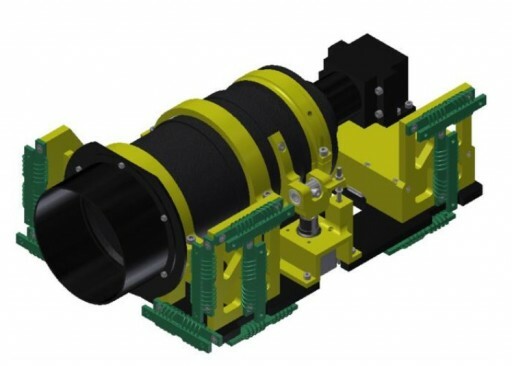 Also, the system is very compact, only requiring a crystal filter to be inserted into the optical path of an optical camera and, as an additional benefit, simple rotation of the crystal lens can remove the optical fringing and permit the camera to capture conventional images. To generate spectral data, the FTR camera has to scan through the area of interest with each detector pixel being traced through the captured images in order to create an interferogram of each image point which is then put through the Fourier transform algorithm to obtain the spectrum for each of the image points. The detector operates at a 100Hz read-out to collect as many scan lines as possible when the satellite passes over a ground target. The Primary Payloads have a common Data Processing Unit and use two cameras equipped with PolarFour filters in front of their lenses. 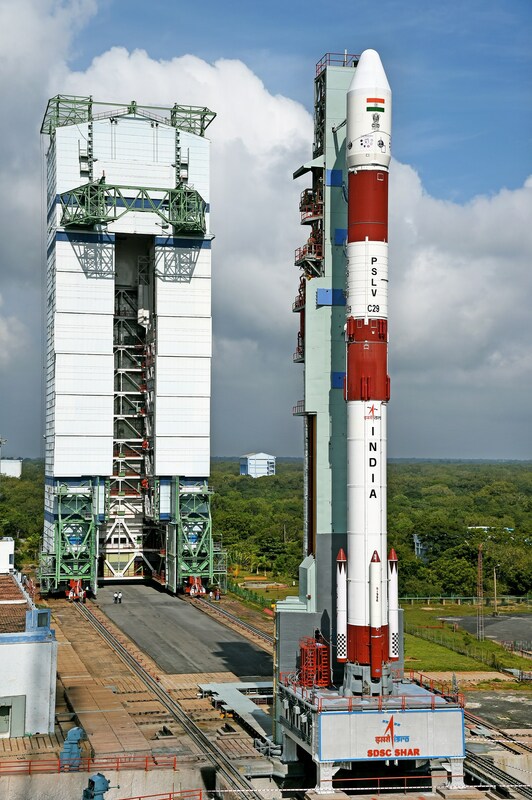 The PPL payload package has a mass of 5.96 Kilograms and measures 13.1 by 22.1 by 26.2 centimeters in size. The PPL1 camera covers a wavelength range of 500 to 900 nanometers from the visible into the near infrared band. It reaches a ground resolution of 44 meters at a swath width of 47.5 Kilometers. PPL1 supports 20 to 30 read out channels making use of a variable bit depth of 8, 10 and 12 generating a source data rate of 1.41 Gbit/s at the 100Hz frame rate. PPL2 is covering the short-wave infrared at 900 to 1500 nanometers, reaching a ground resolution of 110 meters along a broader swath of 56.3 Kilometers. 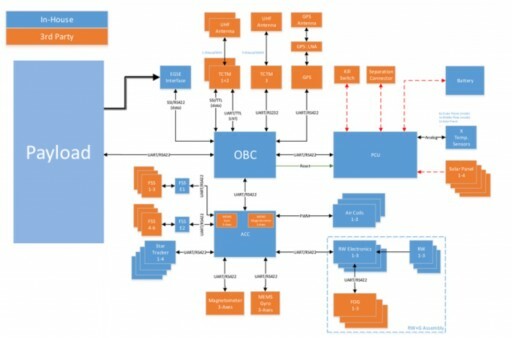 It also supports up to 30 channels, operates at a 100-frame per second read out and a bit depth of 12 to 16. A source data rate of 525 Mbit/s is created by the instrument. 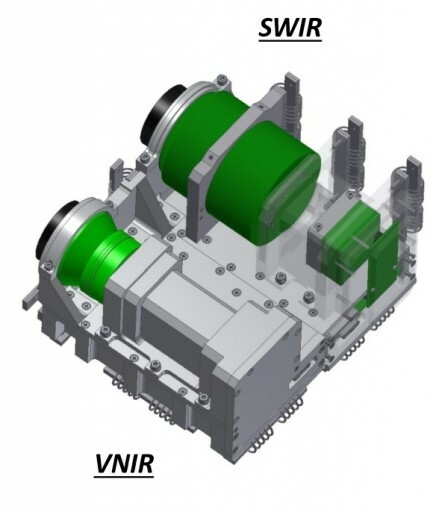 The Secondary Payload, a standard visible imager sensitive for wavelengths of 450 to 630 nanometers, reaches a ground resolution up to six meters with a field of view of 5.75 by 4.75 Kilometers from the operational orbit of the satellite. SPL sports a conventional RGB Bayer Pattern to generate color images. It can operate at a frame rate of up to 30 frames per second, creating a raw data rate of 340Mbit/s. Its main purpose is to deliver complementary imagery to the spectral data collected by the primary payloads. Each camera is connected to its own Data Processing Unit offering 248 GB of Flash memory and 4 GB of RAM. The DPUs interface with a Payload Data Handling Unit in charge of preparing data for downlink.